These pumpkin gnocchi have a mild flavour made nutter with the nutmeg a spice combination made in heaven for pumpkin. The Sage butter is a perfect accompaniment with a hint of chilli. Cut the pumpkin, if it is organic you can leave the skin on, if not, cut away the outer parts, de-seed and cut into medium size chunks. Place them in a pot with very little water and steam them until soft about five or six minutes. Remove from the heat and puree or mash with a potato masher. Add the pinch of garlic powder, the pinch of cayenne pepper, 1 teaspoon. of nutmeg, 1 tablespoon of olive oil and the allspice and mix well. Slowly mix in flour and knead until it forms a smooth dough. 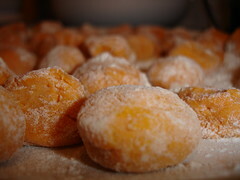 If it is too wet, add a bit more flour until it is a smooth ball of dough. Let it rest for 30 minutes. In a smaller sauce pan, saute garlic with olive oil and butter add the red chili pepper and the sage leaves. When ready to serve, pour the sauce over the gnocchi and mix well. Dust with cinnamon and grate fresh parmesan over the top. Buy Generic Cialis Online For Full Customer Satisfaction. Order Cheap Cialis Prescription or Buy Tadalafil at the Best Prices from 8pills.com. I was a chef for over thirty years and travelled all over the world for eleven years collecting recipes.